Constructing a 3½" gauge West Country Class locomotive. 'Ottery St. Mary' - by the late Alec Hadfield. 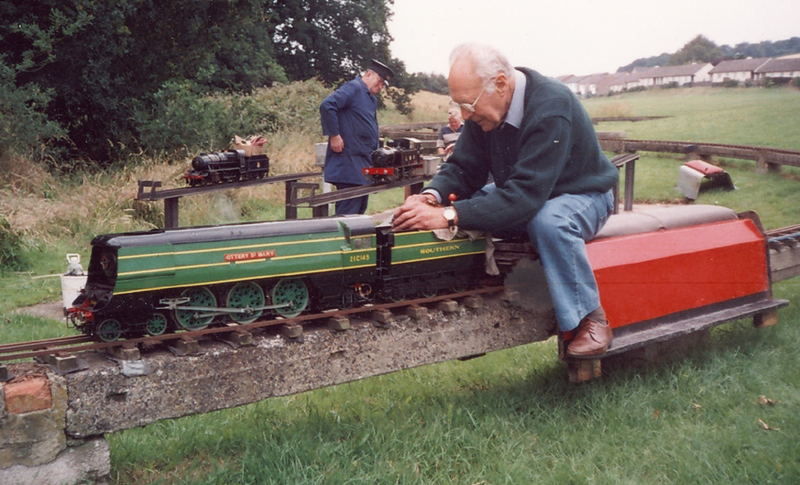 In the early 1950's I had just finished my first locomotive, a 3½ inch scale L.M.S Class 5, as designed by L.B.S.C. At about that time I travelled from Sidmouth Junction to my work at Axminster each day by train. This was usually hauled by a 'West Country' locomotive, and that inspired me to make my next model, a 3½ inch gauge scale model of that class. I decided that I would make the external appearance of the model as accurate as possible, but I would not fit the chain driven valve gear, and would simplify the work by omitting the inside cylinder. I acquired a copy of "The Bulleid Pacifics Of The Southern Region" by Cecil J. Allen, giving me a lot of pictures and dimensions of these locomotives. I already had the back issues of "Model Engineer" magazine covering the building instructions for L.B.S.C's version of a rebuilt "Merchant Navy" known as 'Pamela', and also decided that the cylinders and inside valve gear designed for L.B.S.C's G.N.R. 'Atlantic' known as "Maisie" would be suitable. Dimensions from the 'Pamela' frame drawings were modified to West Country sizes, and the frames cut out to include the apertures for the valve chests of the "Maisie" cylinders. The wheel dimensions were the same for both locomotives, therefore I was able to use the correct 'B.F.B.' disk wheel castings as supplied by A. J. Reeves for "Pamela". The rolling chassis could now be completed, using conventional 3½ inch scale horns, axleboxes, water pump etc. The outside piston valve chests are fabricated dummies to give the correct appearance; the cylinders were bored out to 1.312 inches, otherwise the cylinders and valve gear were made to "Maisie" drawings. The back cylinder covers and piston rod glands had to be fabricated for realism; they were attached using the correct number of studs, 24 x 10BA for the heads, and 12 x 10BA for the glands. The unusual brake gear was a very prominent feature on the Bulleid locomotives, a lot of care was taken to reproduce every small detail on the model, and like the full sized locomotives is operated by a steam cylinder. The boiler was built to "Pamela" drawings, with the length modified to 'West Country' dimensions. To shape the smoke box door and the canopy over the door, formers had to made. Well annealed brass was used and shaped around the formers taking great care not to bruise the metal. Construction of the streamline casing was achieved by making the top and sides out of one piece of sheet brass, a special bending jig was made to form the radii each side of the roof, and using angle brass on the inside to stiffen the assembly. The cab had to be copied from photographs, and joined to the casing with butting strips and countersunk rivets. Cellulose paint was applied by spray gun, masking tape was used to paint on the yellow lines. The finished model was entered in the 1958 "Model Engineer Exhibition", and was awarded a Commended Diploma. After the exhibition, model engineering had to be put on hold because other commitments had to be given priority, I had to move away from Devon to take a job at Worcester in 1971, but there I was able to join the local M.E. society. The engine was given it’s first official boiler test in 1976, now I was able to try the engine on a continuous track for the first time. It behaved really well and from then on has spent many hours passenger hauling on open days. When I retired in 1983 I returned to Devon and became a member of the Exeter society, and after a few years running on their track the engine was stripped down for an overhaul and repaint. Very little needed to be done, new pistons with "O" rings replaced the graphite yarn, and a few bronze bushes had to be replaced. The engine was repainted with malachite green supplied by Phoenix Paints, and lined as before. The locomotive is still in good working order, and was recently issued with a new boiler certificate.